b. Assigned, but not in use. c. Shared with Guadeloupe and Saint Martin. 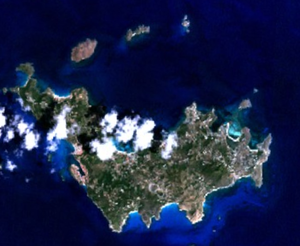 Saint-Barthélemy was first claimed by France in 1648. It was sold to Sweden in 1785. Sweden sold it back to France in 1878. The Swedish period left its mark in the names of many of the streets and the town (in honor of King Gustav III). It also left its national arms, the three crowns along with the grey heron, in the island's coat of arms. ↑ "Saint Barthelemy: People and Society". The World Factbook. Central Intelligence Agency. 13 September 2012 (updated). https://www.cia.gov/library/publications/the-world-factbook/geos/tb.html. Retrieved 19 November 2012. ↑ "Populations légales 2009 entrent en vigueur le 1er janvier 2012." (in French). Recensement de la population. INSEE. http://insee.fr/fr/ppp/bases-de-donnees/recensement/populations-legales/pages2011/pdf/dep977.pdf. Retrieved 20 November 2012. ↑ "French Caribbean voters reject change" (in English). Caribbean Net News. 2003-12-09. http://www.caribbeannetnews.com/2003/12/09/voters.htm. Retrieved 2007-02-09. "However voters on the two tiny French dependencies of Saint-Barthelemy and Saint-Martin, which have been administratively attached to Guadeloupe, approved the referendum and are set to acquire the new status of "overseas collectivity"." ↑ Magras, Bruno (2007-02-16). "Letter of Information from the Mayor to the residents and non-residents, to the French and to the foreigners, of Saint Barthelemy" (in English) (PDF). St. Barth Weekly. p. 2. http://www.st-barths.com/jsb/pdf_files/weekly108.pdf. Retrieved 2007-02-18. "On February 7 of this year, the French Parliament adopted the law granting Saint Barthelemy the Statute of an Overseas Collectivity." This page was last changed on 12 July 2013, at 18:20.